Not just any old bonbons either. 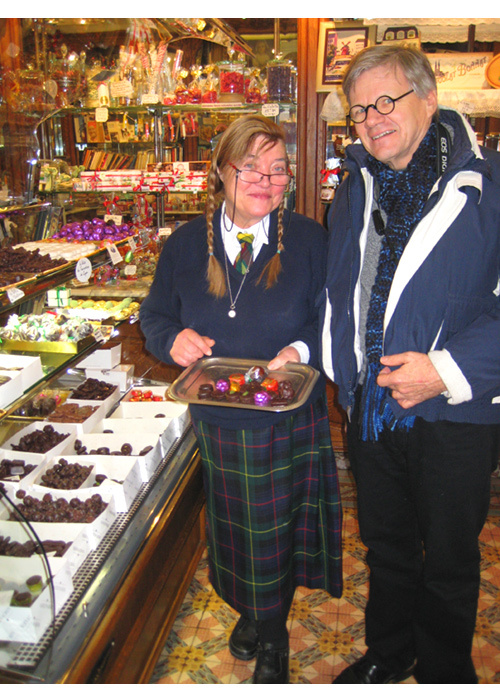 Yesterday, my friend turned me on to a French national treasure—two, in fact: À l’étoile d’or, a magical chocolaterie-confiserie, and its proprietress, Madame Denise Acabo, a wacky little old lady who dresses like a French school girl (and has since she was a French schoolgirl). When we got there, she was behind the register literally slurping up chocolate pudding with sprinkles on top and enjoying the hell out of it. She told us she cannot go a day without chocolate. In this display case are handmade, artisanal chocolates from all over France. Madame Acabo gave us a guided tour of the case, effusively providing colorful commentary on the tiny works of edible art as she hand picked a selection for us. The rest of the shop contains more of the same plus chocolate in many forms from all over the world. At that moment, I wanted to recant all my rants about having to go to 25 stores to make a single meal in a day. I was suffused with gratitude that France does so much to protect small businesses (but I could have just been high on chocolate fumes). What a delicious bob-bon of a post. Your day and the chocolate sounds magical. I will think of you when I go shopping at Costco today. It is a soul stripping experience—but, it is so convenient. I envy the struggle you have in making a meal. Sure, its time consuming, but you get to meet people like Madame Denise Acabo. Pamela, hope you and your frog have a very happy new year!! I think it would be dangerous if I went there – I risk to eat the entire store. I’m moving in with YOU. OK? Yes, Dark with orange is my FAVORITE!!! I just tried the Lindt Extreme Dark with Orange. So good, and yet I am sure it is not half as good as the treats you enjoy en France. Salut Rouge. I used to get those chocolate oranges at Trader Joe’s back in the day; the ones that break into sections. Denise Acabo had this one that was a little ball: half of a tiny candied mandarin orange on the bottom, a cap of dark chocolate on the top half, and under the cap a creamy dark chocolate filling. It was beyond orgasmic. I’m serious, I’ll send you girls some if you want! On one condition, I get to send you something in return!!! And dark, is there any OTHER kind of chocolate???! OK, one taker. Claudia, e-mail me at pamela dot poole at free dot fr with your order! And I bet you get some good maple candy up there… Not readily available here… Sound like a trade? I sure can. Sounds mighty fair to me!!! Hi Rouge! Butterfingers! They have Snickers. They have Mars. They have M&Ms (peanut only–totally random). But I think Butterfingers are just too white trash to have made it to Paris. And there’s a general paucity of peanut products here anyway. They’re all into hazelnuts, which just don’t work for me. Thank you thank you thank you!